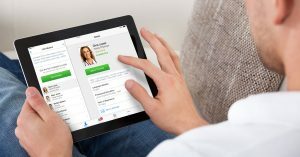 American Well recently announced an exciting new partnership with Tyto Care, a telehealth company with breakthrough technology for conducting remote medical visits and examinations. Through this new partnership, patients are now able to use TytoCare’s examination device and telehealth solution during video visits, allowing providers to deliver more robust care to the home. While an effective telehealth exam can certainly be done via video alone, this Tyto Care, American Well partnership takes telehealth a step further by giving the physician the full picture. American Well’s telehealth technology offers high quality care to patients at home or in other locations. Tyto further enhances that level of care by enabling patients to capture physical exam data to supplement telehealth in many remote settings including the home, school, employer work sites and nursing homes. 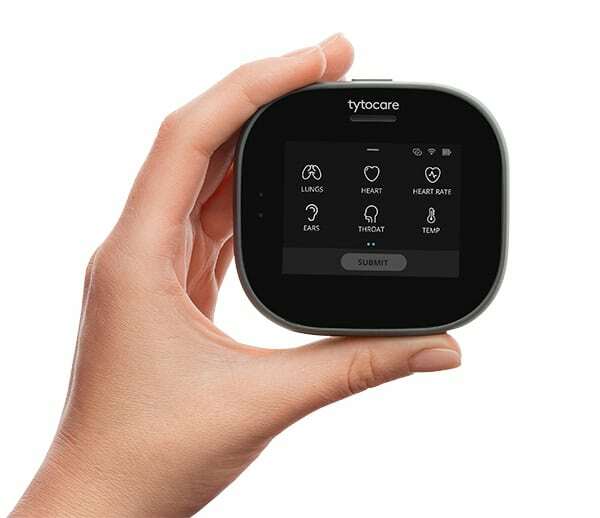 TytoCare is an all-in-one telehealth solution that has a built-in thermometer and camera for taking pictures and video, and stethoscope, otoscope, and tongue depressor attachments for examining the heart, lungs, abdomen, ears, nose and throat. Exams using TytoCare can be performed before or during a video visit. 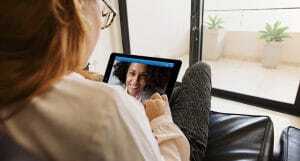 To conduct exams in real-time, a provider can use the “Live Telehealth Exam” feature, where he or she connects with the patient via video and remotely connects to the patient’s Tyto device to conduct exams. Patients can also use the “Exam and Forward” option, where they capture exam data and send it to the physician for review prior to the video visit or for a later diagnosis. Upper respiratory infection or bronchitis: Using the Tyto stethoscope attachment, a patient can take clinical-quality auscultations of his or her lungs, and the physician can review the data and diagnose the condition via telehealth with the same confidence as an in-person visit. Sinus infection: The patient can conduct a physical exam on themselves using the Tyto otoscope attachment to provide images of the inside of the ears and the thermometer to check for a fever. The physician can then analyze the results and confirm if the patient has a sinus infection. Flu: The Flu can produce a lot of symptoms. TytoCare can help better detect these symptoms for the physician during the video visit. The Tyto stethoscope is used to listen to the heart and lungs, the thermometer to check for a fever, and the camera and tongue depressor to take a look at the throat. Sore Throat: A sore throat is a common symptom for a myriad of illnesses. Having the patient use the Tyto tongue depressor and camera to capture images of the throat will help physicians better diagnose the issue. The thermometer can also be used to check for a fever. Ear Infection: Using the Tyto otoscope attachment, physicians can examine the ear canal and drum remotely over video. The thermometer can be used to check for a fever, and the physician may choose to use the stethoscope to look for other co-conditions. Other common acute care illnesses that can be treated using TytoCare include fever, cough, contact dermatitis, wound care, skin eczema, pneumonia, whooping cough, pink eye and more. Chronic conditions such as asthma, allergies and chronic obstructive pulmonary disease (COPD) can benefit from TytoCare by allowing a physician to monitor these conditions remotely. Tyto can also be used for post-discharge patients. For example, a post-surgical follow up patient could use the Tyto camera to have the physician exam a wound remotely. While the average patient has some experience using devices like a thermometer, other devices such as an otoscope or stethoscope require some guidance. TytoCare has built-in guidance technology that enables anyone to accurately and easily capture exam data, so patients and physicians can always be confident that data captured by Tyto is accurate and reliable. For example, when conducting a lung or heart exam with the Tyto stethoscope attachment, TytoCare’s guidance technology will instruct the patient on where to place the stethoscope, accurately record clinical-quality heart and lung sounds, and let the patient know when the exam is complete. 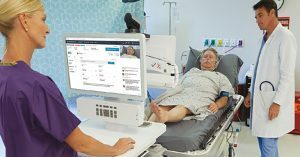 Alternatively, physicians can also remotely access Tyto and help guide patients when conducting a Live Video Telehealth Exam. With the combination of American Well’s quality telehealth service and TytoCare’s intuitive examination technology, physically examining patients via telehealth has never been easier. If you’d like even more information on this exciting partnership, contact our team today.